People have been living on islands in Micronesia for as much as 3500 years. We know that the first people arrived at Ritidian on Guam from the Philippines this long ago, and that their descendants have been in these islands ever since. But to listen to some discussions about future climate change and how vulnerable some islands in this region apparently are, you might justifiably wonder how people have survived for more than three millenia in this part of the world. This summarises the point that sometimes ‘western’ science is not as well-informed as you might expect. In the last few decades, science has correctly identified a challenge for livelihoods everywhere in the world from climate change. Temperatures are rising, sea level is rising, the intensity and frequency of typhoons and droughts are changing, all of which pose complex challenges to the way people live, whether they be in Micronesia or Mexico, Pohnpei or Pakistan. Scientists use global models of the Earth’s climate to understand what is happening, how the complex climate system responds to particular ‘forcings’ and, in doing so, arrive at particular ‘projections’ of what may happen in particular places at certain times in the future. For island countries, rising sea level is naturally a key concern. In Micronesia, where sea level is currently rising at 2-3 times the global average, scientists are thinking about how 21st-century sea-level rise might reconfigure coastal geographies, especially in low-lying coastal areas. Science has taken on the additional burden of advising countries like FSM and its neighbors how they should best prepare for and respond to such climate-driven changes. Global solutions suggest we might either ‘protect’ our shorelines, perhaps by building hard structures like seawalls; or we might ‘accommodate’ the effects of sea-level rise by rethinking the ways in which we use the coast; or we might ‘retreat’ from the shoreline, moving our activities and infrastructure to more secure locations. These three options are often touted as new ways in which communities in countries like FSM should think about responding to sea-level rise, both now and in the future. Commonly such suggestions overlook the fact that people have lived in Micronesia for more than three millenia, during which time they have overcome climate changes, including swings of sea level up and down. How did this happen? Scientists in the Pacific are starting to take an interest in the resilience of indigenous cultures and how their people overcame climate-driven changes to the environments they occupied in the past. For example, we know that in many higher-island groups in the tropical Pacific about AD 1300, there was a fall of sea level (about 20-28 inches in 100 years) that exposed reef surfaces and caused coastal water tables to drop, leading to a prolonged food shortage for coastal dwellers. In many places, this led to increased competition for the dwindling food resources, a situation that led to conflict. In island nations like Fiji and Samoa, this led to the construction of hill forts where people lived for perhaps several hundred years. In the 1860s, a colonial official wrote of Viti Levu Island in Fiji that “jealousy that made every village distrustful of its neighbours compelled the inhabitants to fortify themselves on the most inaccessible heights, and prevented them from cultivating any land beyond the few feet around each man’s dwelling; if more were required, the cultivator, afraid to descend into the plain discovered some spot in the recesses of the mountains where he might plant his yams secure from molestation”. But such situations did not always result in conflict. In many Micronesian islands, there seems to have been less extreme responses by people to past climate changes. And science is becoming interested in these responses and how they might help modern Micronesians meet some of the challenges of future climate change. Most high islands in Micronesia have an abundance of stone, especially in the form of boulders, that appears to have been used by some of the earliest inhabitants of these islands to build structures. While there are impressive inland sites like Sapwtakai on Pohnpei – a bit like some of the Fijian hill forts – the ninety-three rock-founded artificial islands of Nan Madol and its megalithic monuments are what most people associate with human-made structures on Pohnpei. But beyond such iconic and complex sites, there is abundant evidence that Micronesians have for hundreds (if not thousands) of years been routinely building structures from rock along island coasts. Many of these structures are designed to protect shorelines from erosion, perhaps during past periods of rising sea level. Others appear to have been built as a way of making new land, perhaps when sea level fell in the past. Yet others seem simply to have been intended to make island coastlines more stable and therefore better suited to their use by humans. Examples of the latter include the construction of jetties and wharves, harbors and channels for irrigation and drainage. Given that such structures often formed part of a communication network involving stone-laid pathways, it seems clear that Micronesians were among the most adept of all Pacific people at manipulating stone. Sea level is rising faster in Micronesia today than perhaps at any time within the past few thousand years, certainly since before humans arrived on Pacific islands. While the magnitude of the challenge may be greater, its nature is not. Micronesians have been here before. Repeatedly. Traditional knowledge about what structures to build to prevent shoreline erosion and how to build them is extremely valuable, often far better for Micronesian environments that externally-designed solutions. Throughout the Pacific Islands, science is slowly coming to appreciate that Indigenous responses to all kinds of environmental adversity are grounded in long experience and familiarity with local environments. Such traditional knowledge should complement science-based solutions for dealing with the effects of climate change. Photo 1. 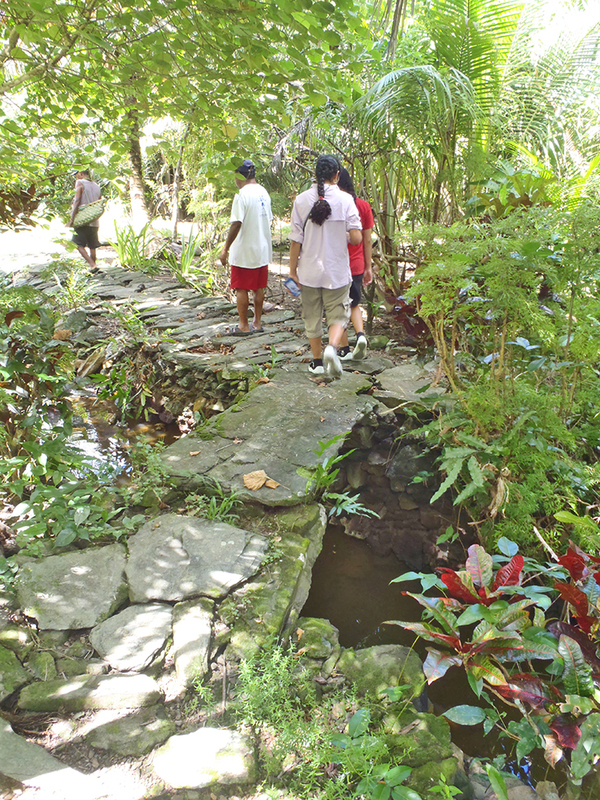 John Runman from Yap HPO leads a group along the stone paths and bridges at Gaanvang Village on Rumung Island in Yap. Photo by Patrick Nunn. Photo 2. 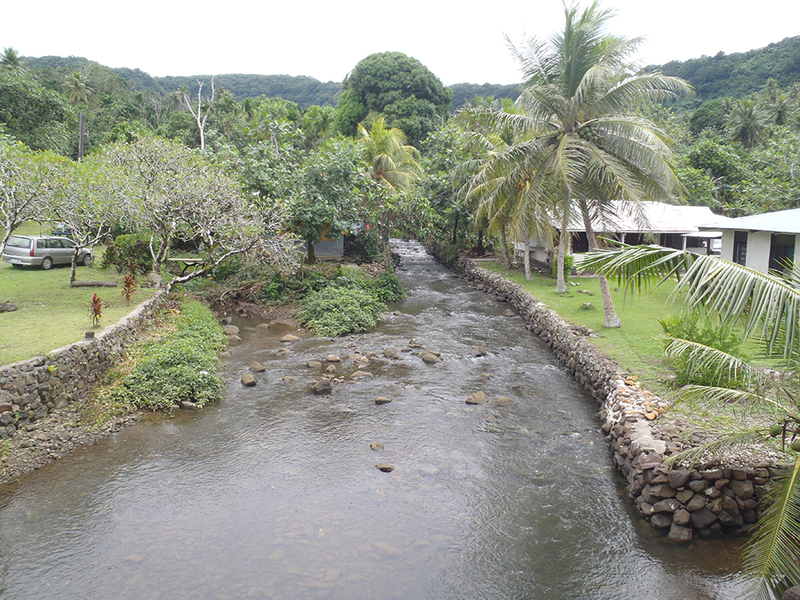 Stone walls lining the river at Alamoar Church on Pohnpei are probably modern counterparts of much older structures intended to stabilize the river banks and even to reclaim land along this narrow coastal strip. Photo by Patrick Nunn.